1951 Topps Red Backs and Blue Backs are designed to be used to play a baseball game by shuffling the cards and drawing them to simulate game action. 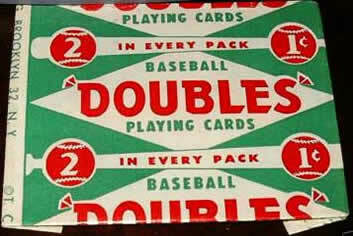 The Red Back set is designated as set "A" by Topps; the Blue backs are set "B". Both sets were sold at the same time. A complete Red Back set contains 54 cards due to the fact that Gus Zernial, #36, can be found first as a member of the White Sox, and later as a member of the Athletics. He was traded on 6/15/51. The Chicago version is worth twice as much as the Philadelphia version. Tommy Holmes, #52, was named manager of the Braves farm team in Hartford after the 1950 season. He was called back to the Braves on 6/19/51, as their manager and sometimes pinch hitter. Beckett lists the more expensive Braves version of his card as 52a, and the Hartford card as 52b. It seems to me that they should be the other way around. 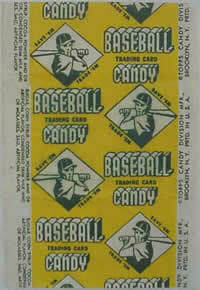 The thick cardboard cards have rounded corners and were sold in perforated panels of two for 1¢. They have a black-and-white player photograph on a red, white, blue, green, or yellow background. Minimal information about the 1950 season is printed in the lower left quadrant. 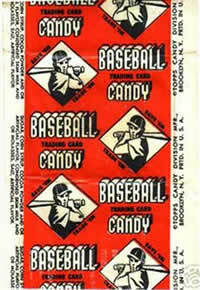 They were packaged with a piece of caramel candy, which sometimes melted, damaging the card. Red Backs are easier to obtain than Blue Backs. A Blue Back set is valued at almost $1000 more than a Red Back set. For some reason the Blue back Richie Ashburn, #3, is the most expensive of all the cards - around $225, in near mint condition. Hall of famers in the Red Back set include Berra, Rizzuto, Wynn, Kiner, Feller, Spahn, Snider, and Irvin. Blue back HOFers include Ashburn, Schoendienst, Slaughter, Doerr, and Mize. The only rookie of note in the Red Back set is Monte Irvin; Billy Pierce is the key rookie in the Blue Back set.